OK boys and girls, so you are thinking about becoming a truck driver, and through the course of your research, you were lucky enough to stumble across this site. So first, let me just say, Welcome!! Glad to have you!! 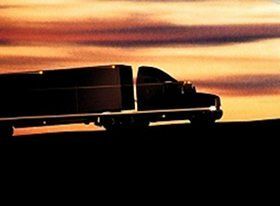 If you're not certain about whether or not you'd like to become a truck driver, start with our guide to becoming a truck driver to learn all about getting your trucking career started. If you have decided to pursue a career in trucking, have you signed up for TruckingTruth's FREE Online CDL Training Program yet? No??? Seriously folks, I cannot say enough good things about this course, it is truly amazing. Completing the course will have you well on your way to obtaining your CDL and hitting the road. If I can blow my own horn here for just a second, as the first person to complete the course in its current form, in its entirety, I wanted to take a few minutes to introduce the program to you and pass on some tips, tricks, and advice to help you out. If you are anything like me, (and if you are, then I'm truly sorry) the thought of trucking school has you a little nervous. I didn't particularly care for school the first time around, and CDL school was one area of this process I was not looking forward to. I have no background in trucking, no previous knowledge, and being female and blonde, I felt I would be going into school with two strikes against me. I was already nervous about the driving aspect, so I thought, there is nothing stopping me from studying the CDL manual before I enroll in school. So I downloaded the CDL manual from my state. The training course begins with the CDL manual, divided into sections, and then is further broken down so that you are working on one page at a time. This page-by-page format is amazing because it keeps you from getting overwhelmed. Let's face it, there is a lot of information to absorb. By breaking it down into smaller chunks, you can focus on learning a little bit at a time. At the end of each page you'll answer a set of questions which covers the content from that page, along with review questions from previous pages, to keep that information fresh in your mind. The review questions you'll see are ones you've missed the most often and need extra help with. Your scores throughout the course are calculated after the completion of each page, and a new set of review questions is put together based on everything you've done so far. In other words, the program figures out where you need the most help each step of the way and adjusts to your strengths and weaknesses as you go. No need to keep track of which information you're struggling with - we're already keeping track of it for you, and presenting you with questions you need the most help with right now. Oh, and this is really important, so pay attention…all of the questions are "open book." That means you can scroll back up to find the answer on the page, or if it is a review question from a previous page, a link will be provided for you to click that will pull up a box containing the section of the page the question pertains to. So what you need to take away from this little tip is…do not guess! The questions on each page are not to test your knowledge. They are a learning tool to reinforce the correct answer through repetition. By guessing, and guessing incorrectly, all you are doing is reinforcing the wrong answer in your brain. Your brain does not have a delete button, so once that wrong answer is stuck in there, you are going to have to work very hard to get it unstuck and replaced by the correct answer. I was guessing at first, and missing a lot of questions, and when they popped up again later as review, I would miss them again, because I couldn't get the wrong answer unstuck…believe me, I tried everything from a crowbar to WD-40; didn't work. So, please, don't do what I did and guess. Even if you are 100% sure you have the right answer, scrolling back up to read through the information again or clicking on the link to view the content containing the answer is going to reinforce that information in your brain. If we find you're struggling too much with certain questions, the system will stop presenting you with new materials and will give you some extra review questions to make sure you've learned the materials thoroughly before moving on to new stuff. Once your scores are back up to where they should be, you'll be able to continue on to new materials. Take Notes? Are You Kidding? That's right - take your own notes. Yes, I know, it seems like school, but reading the information and then writing it down is going to make it stick in your head better. And I don't mean copy things word for word, though you can do that if you want. But you really just need to jot down any information that seems important to remember. Also, the purple question marks that appear throughout the course…these are your friends. You'll love the purple question marks! Click on the purple question marks…its ok…they don't mind. What you will find is some tips and advice from TruckingTruth regarding what information is likely to appear on the CDL exam, what you must memorize, what you just need to understand the concept of, what is just provided for your information…all that good stuff. After completing each set of questions, you will be given your score and the chance to review the questions and answers. My advice is to review them all. Do not just review the ones you missed, because the review shows not only the information as it is provided in the course, but also additional information provided by TruckingTruth. This is another area where you may want to jot down some notes. Again, reading the information and then summarizing it in your own words will help you retain the information. Finally, if you come across a section you are having a hard time with, do not hesitate to pop over to the trucker's forum and post a question or two…or ten. Everyone here at TruckingTruth is dedicated to helping people on their journey to becoming a professional truck driver, and we will not hesitate to answer any questions you may have. Remember, the only stupid questions are the ones that go unasked…don't be stupid. So, to summarize. Take notes, look up the answers, don't guess, click on the purple question marks, and ask questions in the forum. By following these tips, you will breeze through the online training course, and head on into truck driving school with confidence that at the very least, the classroom portion will be under control. Best of luck! Now head on over and sign up for the free online CDL training course!